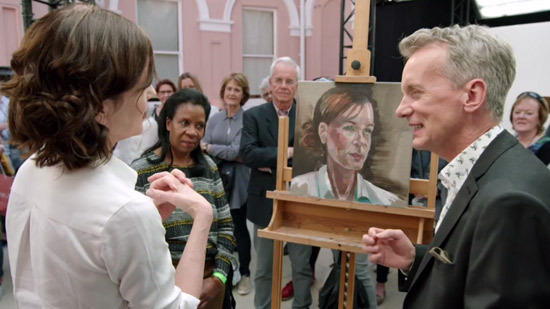 This week, I return to making comments about people painting portraits on television, after having posted my own credentials for Drawing People last week after the last review of the Portrait Artist of the Year series. You can see links at the end to my reviews of the first four episodes. Sarah Hope - Lives in Newport in Pembrokeshire. She has a degree in fine art and returned to art 10 years ago after bringing up her family. 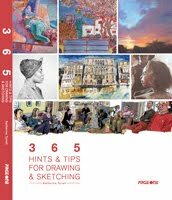 in 2017 she was one of the Artists & Illustrators Magazine ‘Artists of the Year 2017’ Prize Winners. 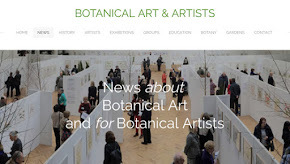 This is her blog post about the day itself and what she did next - which was basically use her coloured pencil drawing to create an oil painting of Fiona Shaw. Lee Fether - I thought her work looked familiar and looking at her website it's because I've seen it before! She has a design degree from Central School of Art and Design and was selected for the BP Portrait Award in 2009 and 2011. 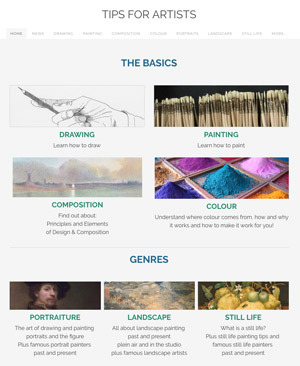 Richard Kitson - clever man - he's got his self portrait and the logo for Portrait Artist of the Year on the home page of his website! He's got a degree in Fine Art. Currently he paints, draws and makes etchings in his studio in Barnsley - and he's got his first solo exhibition of his portraits at the Cooper Gallery in Barnsley opening on 14th April. Georgia Palomba - from Prestatyn in North Wales. She lists herself on Pinterest as "fine art student, boxer, pole dancer". She's studying fine art at Kingston University. Jonathan Stockley - very succinct bio on his website "Born in Wokingham, England. Raised in Lurgan, Northern Ireland. 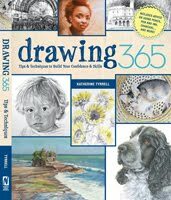 Living in Coatbridge, Scotland and currently working as a Modelmaker in Newcastle upon Tyne, with drawing in my spare time" Having started out as a pet artist who has progressed to doing proper portraits of people - but from photographs. Corinne Pierre - Originally comes from Guyana (British Guiana South America). 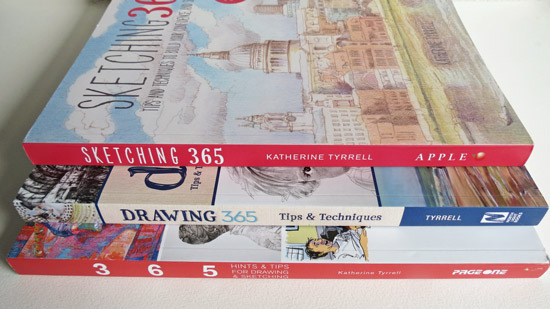 She obtained a BA in Illustration at Bristol Art School. She now lives in Gloucestershire. Note the variation in sizes of the self-portraits submitted. Of course the impact of the dimensions will have been greatly diminished when viewed online - which is how selection is made for the Heats. This is the first time the Judges have seen the self-portraits "in the flesh" as it were. You can get a sense of scale by looking at hwo big they look relative to the size of the presenters and judges! 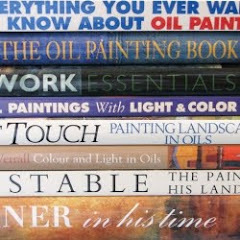 Frank made an interesting comment about it being a bit like dating apps where you see the photo online and now you get to meet the person for real - and asked which of the painters did they want to meet. It's an interesting question. This is the first time you get to create an impression. Does the way you design your self-portrait and then render it make a difference to your chances of selection? I would suggest that it does - but also that viewers should listen carefully to WHAT it is about the portrait that impresses. Paralympic gold medalist Kadeena Cox. I often discuss the question of what impresses judges in terms of portraits produced for competitions. I've long held the belief that in relation to something like the BP Portrait Award that 'Head, upper torso and hands' is a much better bet than just a head and shoulders approach to portraiture. For one thing it's more of a challenge and is also likely to represent the sitter better. However in four hours there's a limit to what you can do. Watching the series it's very interesting to see how much of the person the artists try and do. I can see the argument that focusing on the head and shoulders makes it easier to get to the end of the four hours with a decent portrait. However it's also very evident that the Judges make allowances for those who attempt a lot more. The issue for me is whether you choose the right amount of sitter for the support you have chosen i.e. this is not a background painting competition! I know I've mentioned this before - but it's the issue which keeps striking me most in terms of which portraits impress and which let themselves down. To my mind, the artist who treats the WHOLE of the canvas as the support for the portrait - and not just as some sort of available space which they might paint part of - does better. In other words those who treat the edges of the canvas as the defined limits of the composition and the design of the portrait as 'image' seem to do better. Just take a look at the three portraits at the end - and which head looks best on the canvas. Besides placement, the other thing which is really critical to having the right sort of impact - especially when comparing one portrait with another - is SCALE. 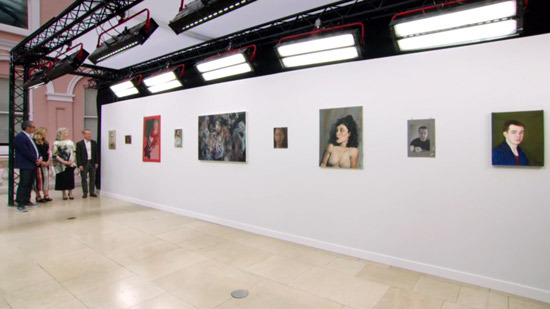 Interestingly, one of the portraits this week was much bigger than life size and Kate Bryan commented that if she had taken the size of the head down about 30% it would have been a much better painting. One of the participants last week wrote to me after seeing my review - and told me what happens. "....re pre- preparation of surfaces for the competition. 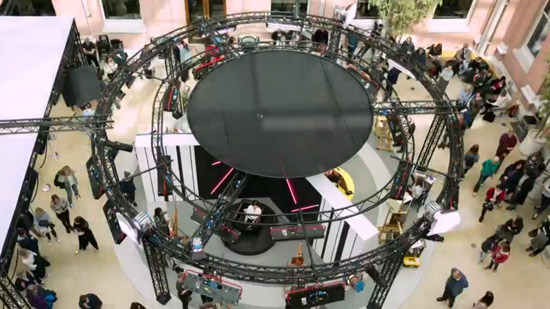 Basically we were told not to do any prep of the surface, and that included any grids, if used or background colours." This week we saw the artists actually doing their gridding up of their supports in preparation prior to starting to draw. Obviously this works best if you know what size of grid works best for you and you don't have to start working it out on the day! 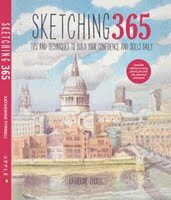 Those of who have gridded up in the past know that in reality you need more detailed gridding on the areas of details and virtually no gridding at all in areas which need less attention. It's really good to see the diversity of people that Sjy Arts invites to be sitters. However for those who only tend to paint people with the same skin colour as their own they are going to have problems in working out how skin tones work if then presented with a sitter with a skin colour they are not familiar with. Note also this works both ways. It's just as difficult for a person with African heritage to get porcelain skin right as it is for somebody with pure driven Angle Saxon skin to render darker skins correctly. What makes a difference is taking time out to practice - with real people not photos! It's also more evident when it comes to the painting in the Heat! I reckon I can now spot who's going to win by the way they get covered as they walk into the Wallace Collection. It's all a matter of editing - and the Editors shouldn't give the game away so easily! Frank was trying to get the sitters to try and use a word other than "Wow". Thing is "Wow" is a very neutral way of saying both "I love it" and "I hate it"! However the sitters did try - and Kedeena Cox won! Again one of these portraits made it through to the shortlist. Deliberations by the judges are always interesting. We never ever see the portraits they are discussing - but there's a lot to be learned about things they like seeing and the things they feel mean a portrait falls short. Then we came to the announcement of who had made the short list. I think some artists were expecting it - and some were very clearly not. 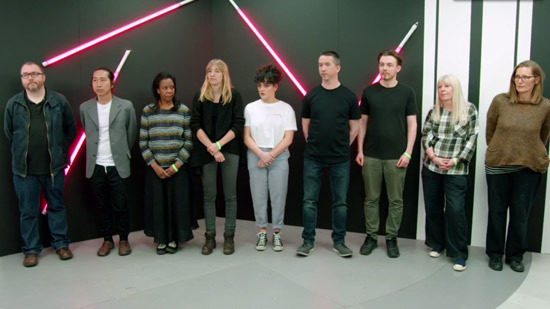 It was very apparent that amateur artist Corinne Pierre (third from left above) was "gobsmacked" by the announcement that she had made the short list. She was not expecting it. 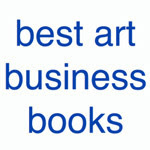 The shortlisted artists were Lizbet Dingemans, Liam Dunne and Corinne Pierre. As usual you can see their self-portrait and 4 hour portrait of the celebrity below - with my commentary. This week I think Lizet Dingemans may have created a better impact if she had just done a bigger portrait. She focused on the head - but the head is actually about 20% of the total canvas. The torso doesn't add a lot and certainly does not include hands so I question why Lizet took this approach to painting Elaizabeth McGovern. 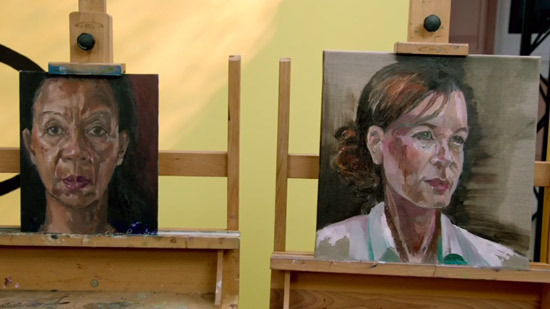 I think if she'd done a larger profile of the head (or just worked on a much bigger support) she may have given herself less to do in terms of the proportion of the canvas which added little to the whole and demonstrated more of her obvious capabilities to paint using colour. That said the painting is excellent and the proportions are good and she has captured a likeness. 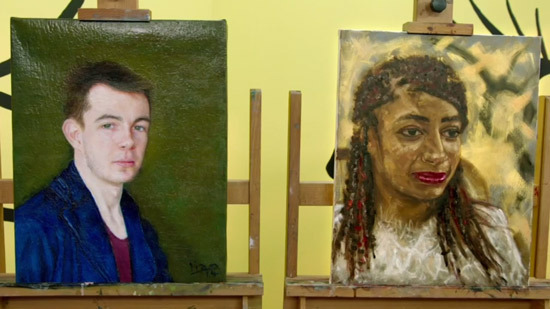 However while the judges recognise the quality of classically trained artists, I'm not convinced that they really like the portraits they produce. I liked the fact Liam made the background and the foreground work well together. That was a really horrendously distracting colour and graphic. 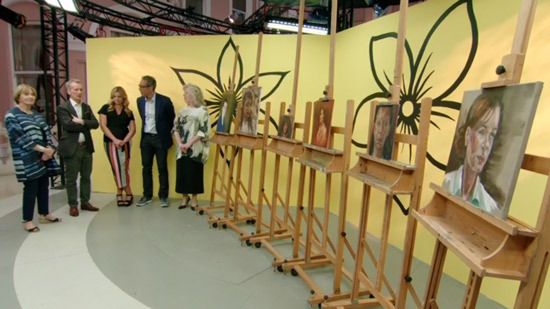 (Somebody working for Sky Arts who does the backgrounds for the sitters needs another job - and fast!). He also addresses scale and fills the canvas well. However it's not a flattering portrait and it would have been easy to forgive this if the draughtsmanship had been better. I'm also not convinced that the focus of the eyes is converging rather than diverging. However, for me the major issue is that if there is a major gap in terms of style and finish between the original self-portrait and the portrait executed in four hours one has to ask the question whether the artist has acquired enough experience to have found their own style. The major bonus about these two portraits is they look like they were done by the same artist! 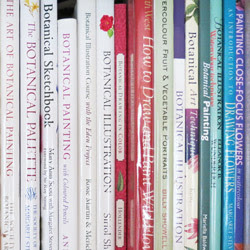 don't apply unless you've painted yourself before - more than once - because it shows! paint your self-portrait in less than four hours. 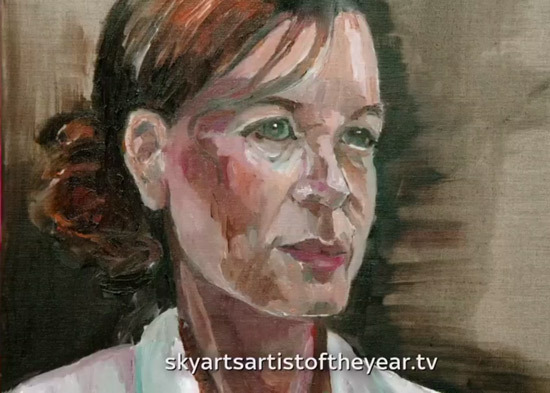 I like the fact Corinne really focuses on the face and how she uses her paint and refines as she goes. I also very much like the size of the head, its placement on the canvas and the fact that the majority of the work in the painting is in the head and the likeness. After discussing the somewhat tricky selection of the shortlist, it became apparent that choosing the winner was somewhat easier. Being chosen as the winner of Heat 5 came as a major shock to Corinne Pierre. She confessed to feeling dizzy! 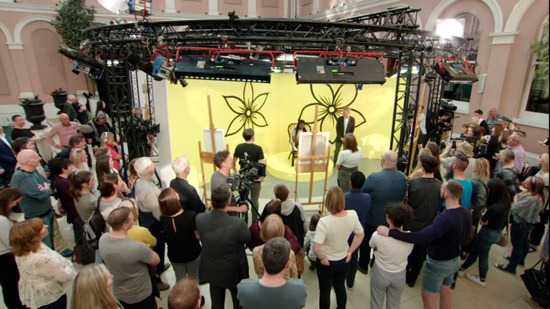 At the end of the programme there is a video showing how the painting emerged from an amorphous "swirl of paint" which is worth watching a few times! Yet again, it's another woman making it to the next round! The men had better pull their socks up - there are only three heats left! 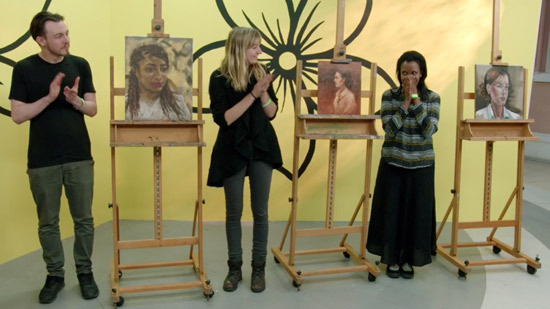 The sitters for Heat 6 are Kenneth Cranham, Claire Skinner and Sope Dirisu. I've started trying to work out which Heat I attended - and I think it must be Heat 7. 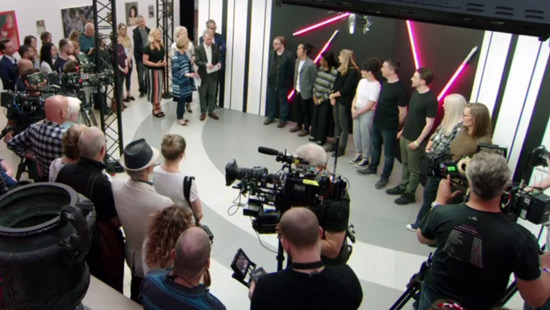 Below are my blog posts about the competition and my reviews of earlier heats - in which I comment on specific aspects to aspiring future contestants! I find your reviews as interesting as the program to which I am now so hooked that I am watching all previous series as well! He was deffo my fave from this heat and possibly from this years PAOTY. https://www.saatchiart.com/PhamVanDuc or Phan Duc Van is the Vietnamese artist, possibly my fave from this whole series!